It has been ten whole months since I decided I wanted to make video games for a living. Since that time I’ve purchased well over $1,000 worth of books, games and consoles in an attempt to immerse myself in an arena I’ve been away from for many years. By leveraging my existing skills, I was able to get my foot into the door as a developer for a upcoming kids-oriented MMO by day. I am also designing and programming games for the iPhone on my own. I took a little break from iPhone programming during the last quarter of 2008, but the innovation I’ve seen in other apps has brought me back to the land of Objective-C. And yes, I am planning an update for Tiny Violin. 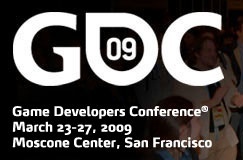 All this is to say that I will be attending this year’s Game Developers Conference next week, and couldn’t be more excited! I’m really looking forward to meeting fellow game-makers, especially on the iPhone-front.